Closed-panel inspections eliminate inherently high-risk tasks, such as removing panels or opening hinged doors, making IR inspections safer for personnel, plant assets and processes. The more efficient work process can also reduce inspection costs by 75% to 95%, while improving worker safety. How does your facility inspect equipment that can no longer be opened while energized due to that equipment’s voltage or incident energy rating? How does your facility inspect equipment protected by switched interlocks? IR inspection windows allow maintenance engineers to monitor otherwise “inaccessible” equipment. 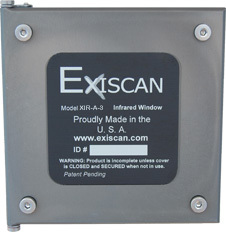 The XIR series is built to out-live your enclosure. Our window body and cover are machined from half-inch bar stock aluminum. All other components are stainless steel. When it comes to durability and brute strength, ExiscanTM is without peers. See it for yourself, contact us at 419-887-5890. Because using inspection windows does not increase risk of electrical hazards, inspections can be performed during peak load, when data collection is ideal, without worry of accidental process interruption. Give us a call at 419-887-5890 or fill out this form for help in selecting the right system to meet your needs. © 2016 Alignment Supplies. All Rights Reserved. Send us any comments, feedback, suggestions, or problems you've encountered with our Products and Services.